Rinzin Dorjee is a rising senior, studying International Comparative Studies (Europe), Italian and European Studies (French and Italian), and Markets and Management Studies. During his freshman year at Duke, he co-founded the civic engagement organization, ‘With Love From Duke’ to empower orphaned refugee children in India and connect them to Duke students studying refugee and resettlement policies. 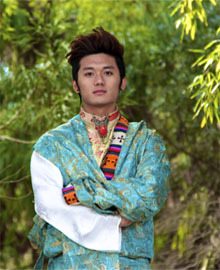 Rinzin is a stateless Tibetan refugee, born in the Phuntsokling Refugee Settlement in India, who received his education at SCCH in East Sussex, United Kingdom. He was granted political asylum in the United States in 2012. At Duke, he is involved with Vision for North Korea, Duke International Association and The Standard. This project was originally going to take place in summer 2015, but due to the earthquakes in Nepal, Rinzin decided to postpone his trip to 2016. This May, he will travel to Kathmandu, Nepal to document the plight of Tibetan refugees through a short documentary and a collection of 100 portraits for a video and photo exhibition. The project’s ultimate goal is to create global awareness about the challenges of displaced Tibetan refugees, and to understand the dynamics of resettlement in the wake of the Nepali government’s minimal support.